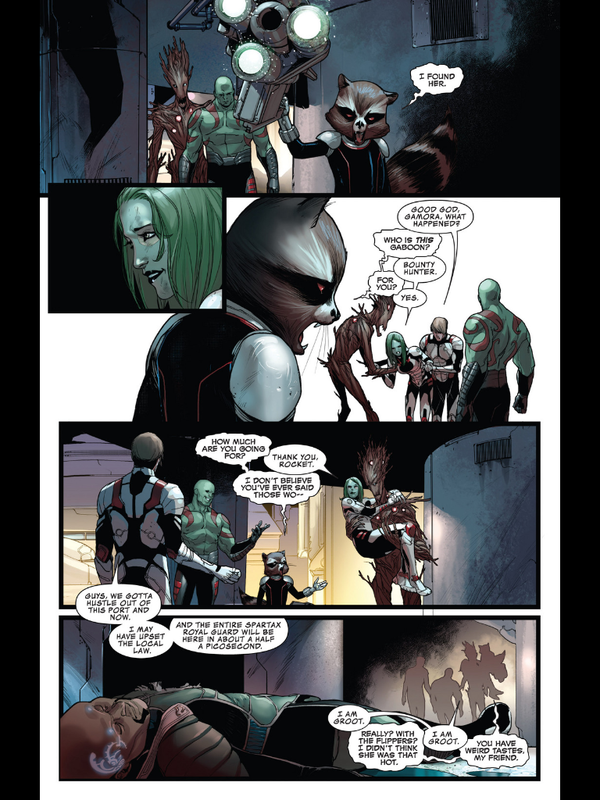 Last issue, the Guardians, taken captive by the king of Spartax, were rescued by Groot, who had spent the whole last issue regenerating from being blown to bits in issue #1. 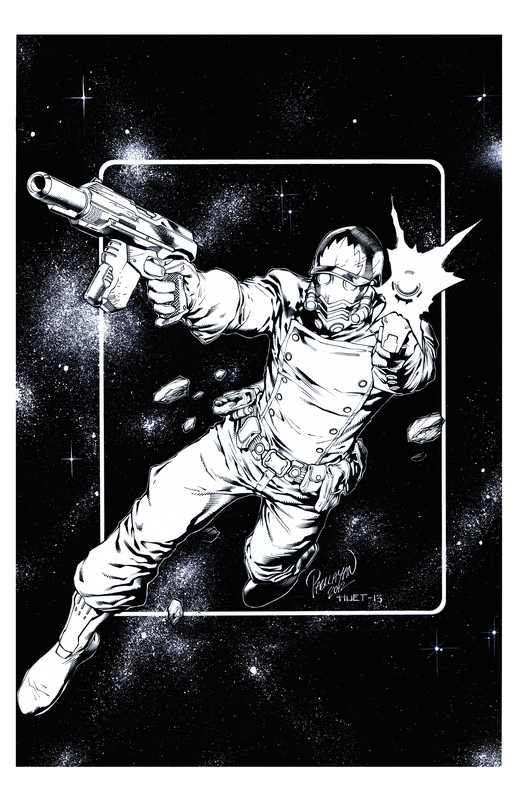 Before taking off in the commandeered Spartax ship, Star-Lord announced to the entire Spartax fleet the hypocrisy of the king’s plans. This issue starts with our heroes partaking in some much needed R&R at a space bar, toasting to their most recent savior, Groot. 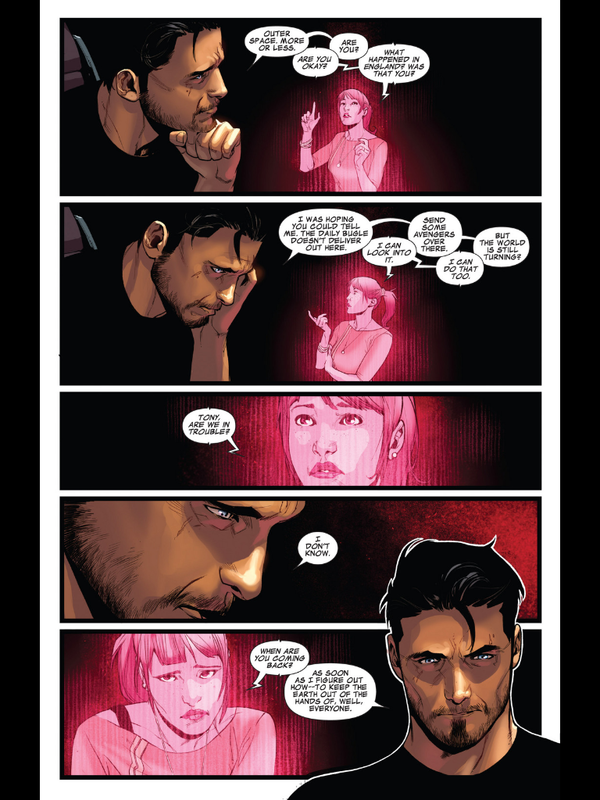 During a casual conversation, Tony Stark manages to get the attention of the most dangerous woman in the universe. Meanwhile, back at the bar, some members of the Spartax royal guard have found our heroes. Well, here we go. 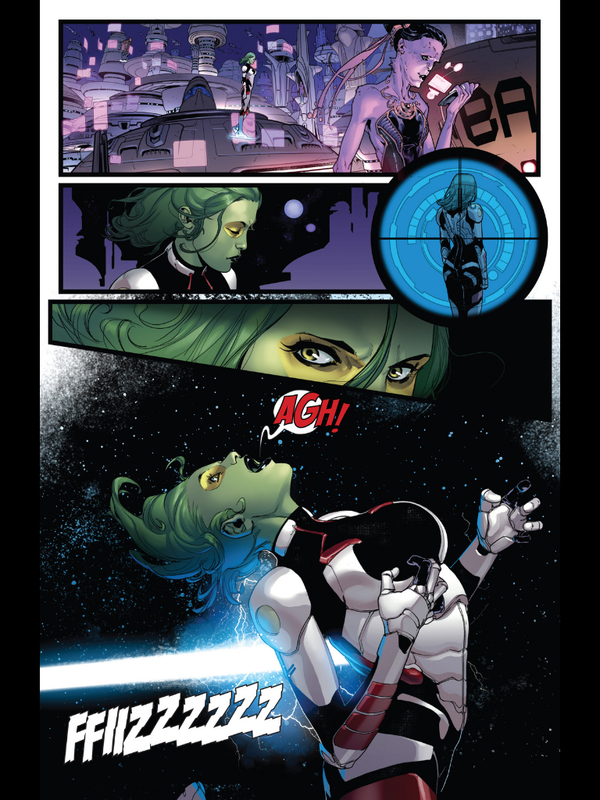 As Drax and the others engage the Spartax guards inside the bar, Gamora has discovered that she’s got a bounty on her head. 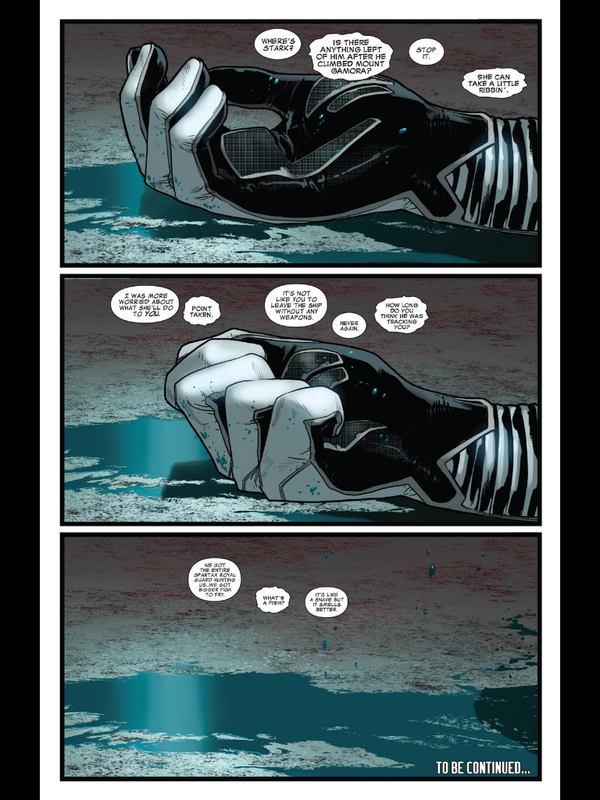 During all the mayhem, Tony Stark makes a cross-stellar phone call back to Earth. 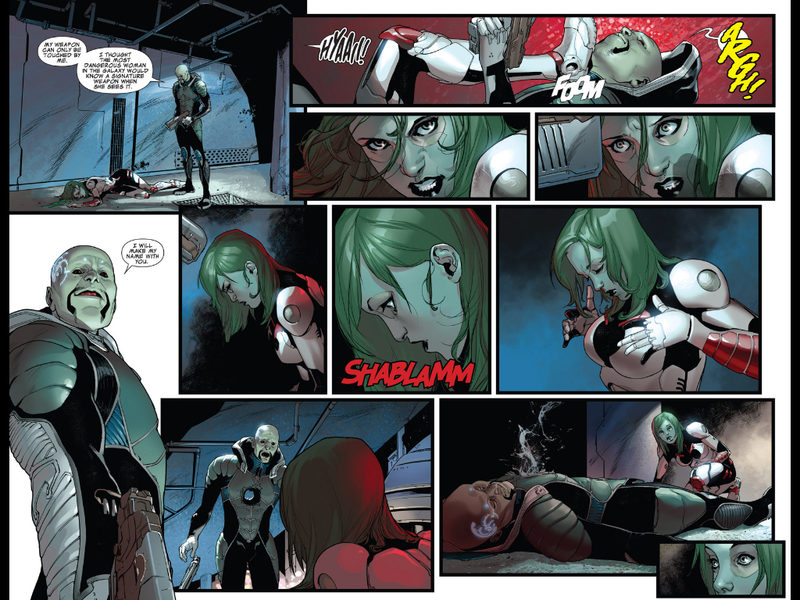 Back in the alley, Gamora faces death. Okay, even though every issue, so far, has been pretty entertaining, I have to say this one was still a bit of a disappointment. It’s clearly just killing some time before issue #5 and the return of Angela, but that’s not even what bothers me the most. 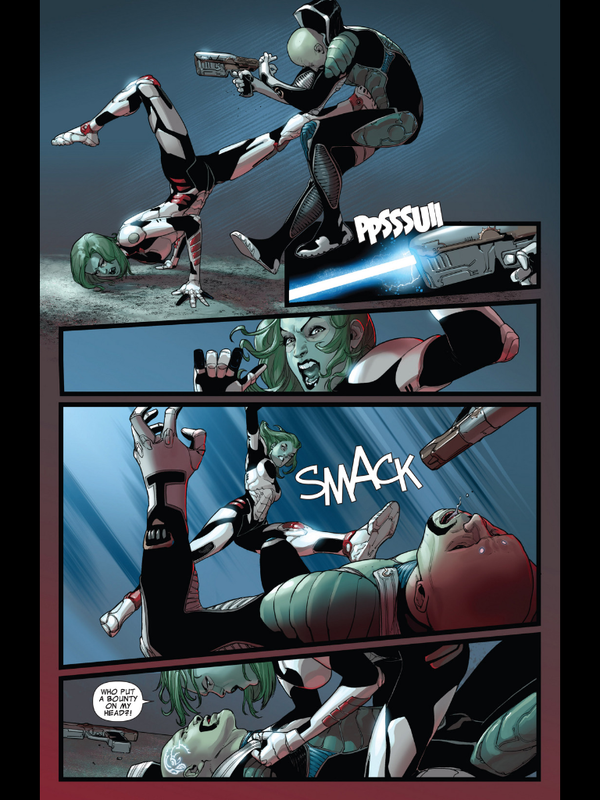 I didn’t particularly enjoy the depiction of Gamora in this issue. 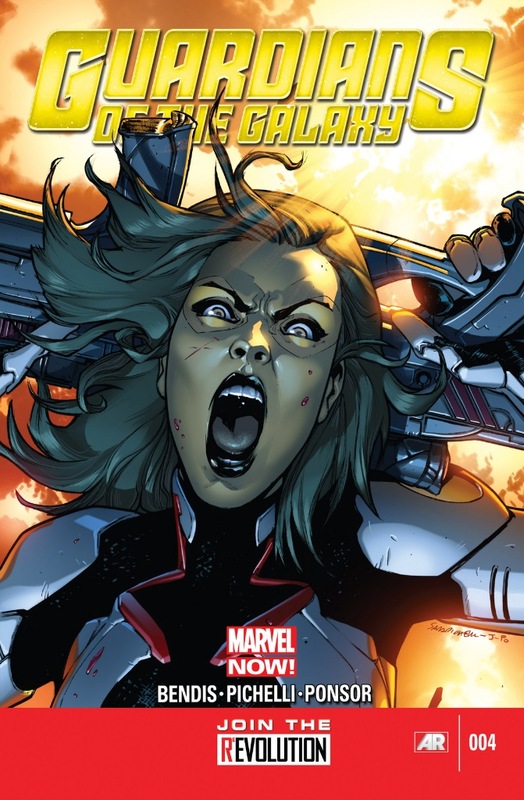 She’s the most dangerous woman in the universe, and the daughter of Thanos. 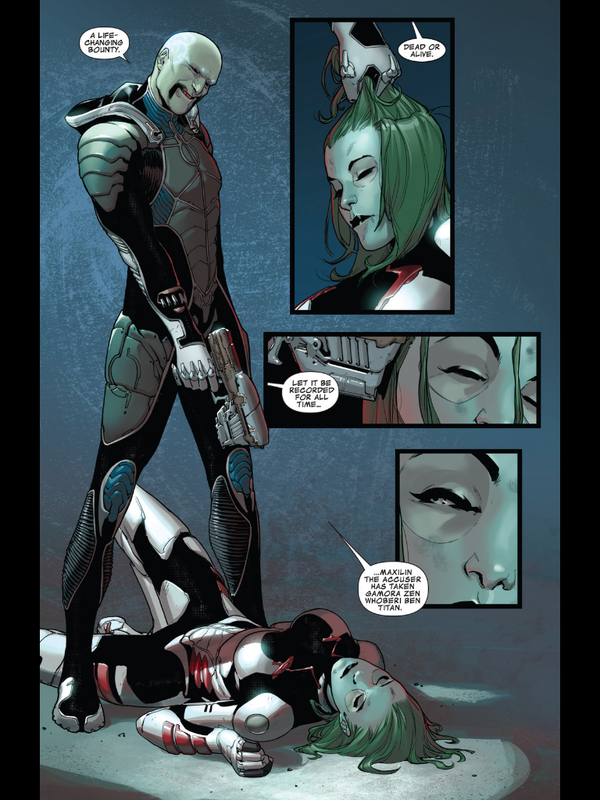 Historically, she’s always been a tough-as-nails assassin, without much of a sense of humor, or a feminine side. Sure, she’s been romantically involved before, but here, she sort of acts like an 18-year-old girl. 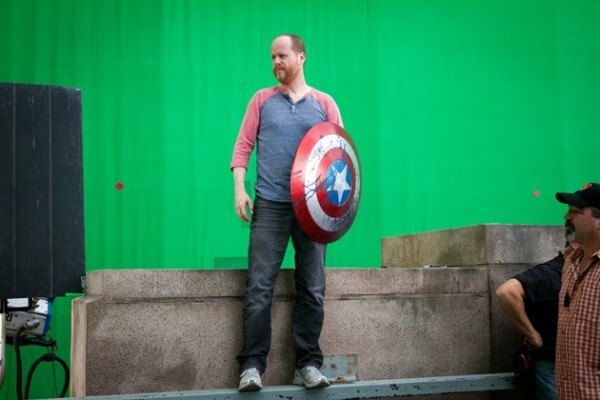 The only thing she doesn’t do is twirl her hair talking to Tony Stark. I don’t believe for one minute that she’s the most dangerous woman in the universe. If she wasn’t a principal character of the book, I would’ve expected her to die. 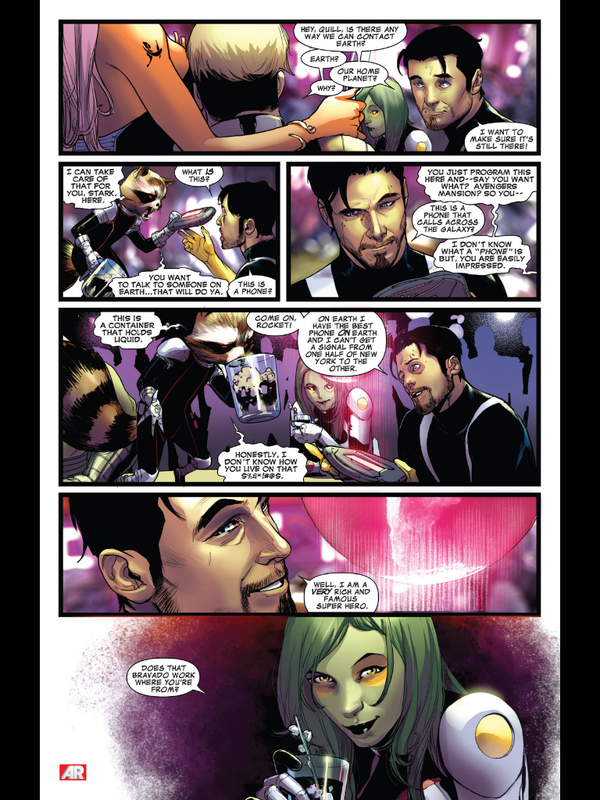 The only thing that did make sense was the post-coital awkwardness between her and Tony Stark. Aside from that, there were some fun to be had watching everyone else just relax for a little bit. After the non-stop crises in the last three issues, they deserved a breather. 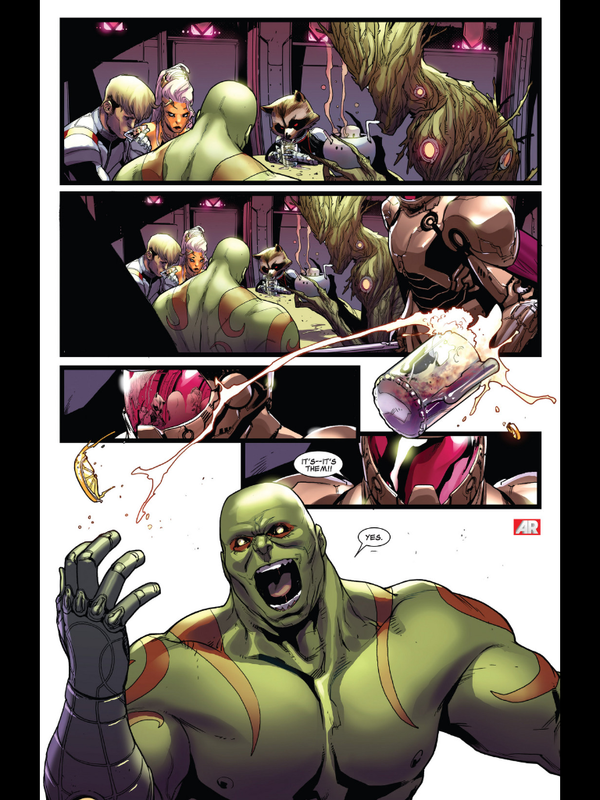 We even got to see Groot drunk (which, come to think of it, doesn’t sound like such a good idea, considering how little space there is for a big guy like him inside the bar). 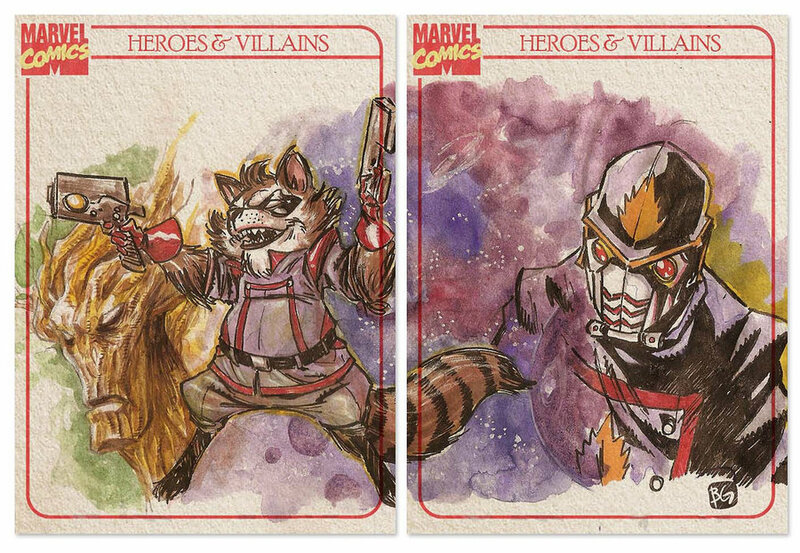 And Tony Stark and Peter Quill got to be their smarmy selves (and one of them was successful!). At the end of the day, though, this issue didn’t really move the story forward, so it’s hard to justify it. On the bright side, we get Neil Gaiman and Angela next issue, and that’s more than enough to look forward to.